Sit down. Extend your soul. Write. Reflect. At Lenity, we believe in kindness and compassion. We believe in sharing it with others, our clients and their families. We also believe in creating an environment where you and your family can achieve a financially sustainable and healthful lifestyle. Journaling is an important tool to assist you in achieving your goals. Being kind and compassionate to yourself is a big part of the path toward achieving success, personally and financially. It’s been our experience that journaling can help provide you with insight into you. Self-awareness, sensitivity to other people and how they impact you, clarity, freedom of expression, ideas, memories, true passions for what you want out of life and for your future. Let us collaborate with you and your journaling efforts. Through self-reflection, we believe you can gain clarity and transformational ideas that will help you achieve your financially sustainable and healthful lifestyle. 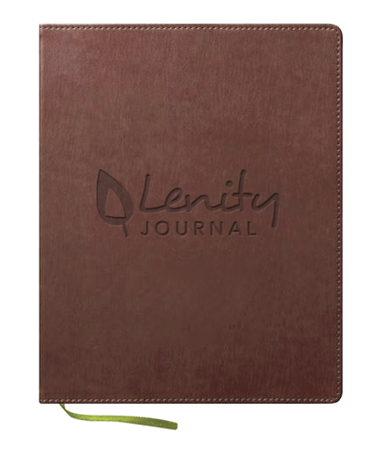 For more information on the Lenity Journal or to buy bulk quantities, contact us today.